With deep sadness we announce the passing of the Christian Nugent the Country Representative of the Reunion Islands. 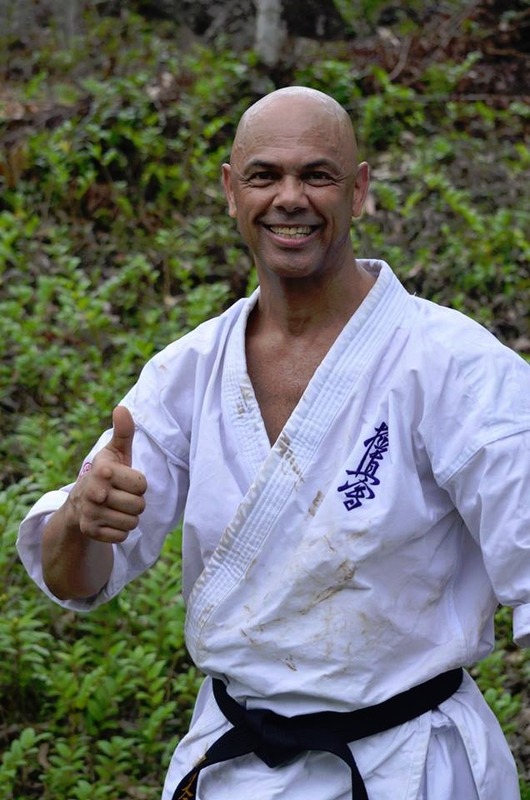 Originally a Godan in Shotokan Christian joined the IFK in 2013 working with the representative in Mauritius to integrate into the organisation he became a Nidan in Kyokushin in 2016. Our condolences are with the family at this difficult time. As the IFK reflect on the success of the 3rd KWU World Championships in Ekaterinburg we can only marvel at the work of the organisers. This event has set the bar as to where we would aim to be if we achieved Olympic status and it shows we are more than capable of doing it. The opening ceremony was an extravaganza of colour and sound that brought the stadium to life and we thank both the organisers and the creative directors for their vision. This 3rd edition of the championships showed the KWU is learning from their mistakes in the past. Competitor check-in procedures were slicker, judging seminars focused on the main issues and as in so many events we didn't witness lots of long speeches by the dignitaries. The athletes were the stars and they rightly took centre stage. 242 competitors from 48 countries meant the majority of the weight categories had solid participation. Of course the KWU could achieve much higher numbers by allowing more than one participant from a country in each division but this would defeat their aim. We all hold our own championships with our own rules, weights and participation levels. This must be different, the five kilogram categories are suitable for an Olympic programme and as with the other combat sports we follow the example of one athlete per country. It is interesting to note that for Karate in the 2020 Olympics it is scheduled for each of the six weight categories to have a maximum of 10 athletes only. At the KWU Championships thirteen of fifteen categories achieved more than that number. Focusing on the performance of the IFK once again we must be proud to have played a major role in its success. We had 52 fighters from 17 countries and topped the medal table with 6 different countries achieving prizes. Of course our major contributor was the top team in the championships Russia, but we also gained medals from Great Britain, Ireland, Iran, Belarus and an amazing gold from Greece! Between 28 to 29 January 2017 held IFK ROMANIAN - Sibiu SPARRING SESSION and KUMITE NATIONAL CAMP. 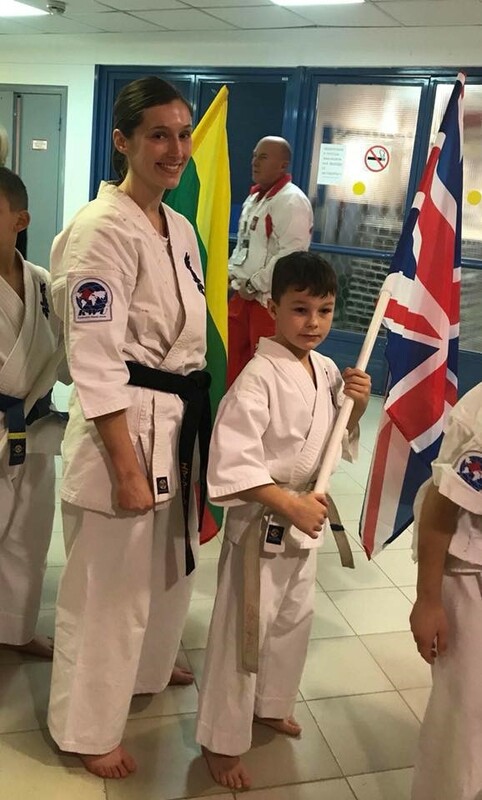 The goal of this event was to prepare IFK ROMANIAN Team for ''KWU European Championship for Children and Youth 2017- Berlin, Germany'' , 5th IFK Kyokushin World Tournament 2017 - Sibiu, Romania and KWU World Championship 2017 - Tokyo, Japan. The event was attended by fighters from 7 cities of the country. At the end of the event, also held IFK ROMANIA meeting for organize 5th IFK World Tournament 2017 - Sibiu, Romania. The 5th KWU Kyokushin Open World Youth Championship took place in Varna, Bulgaria on December 3-4, in beautiful Palace of Culture and Sport. 666 fighters from 33 countries fought for 32 sets of medals in 3 age groups – 12-13, 14-15 and 16-17 years old. 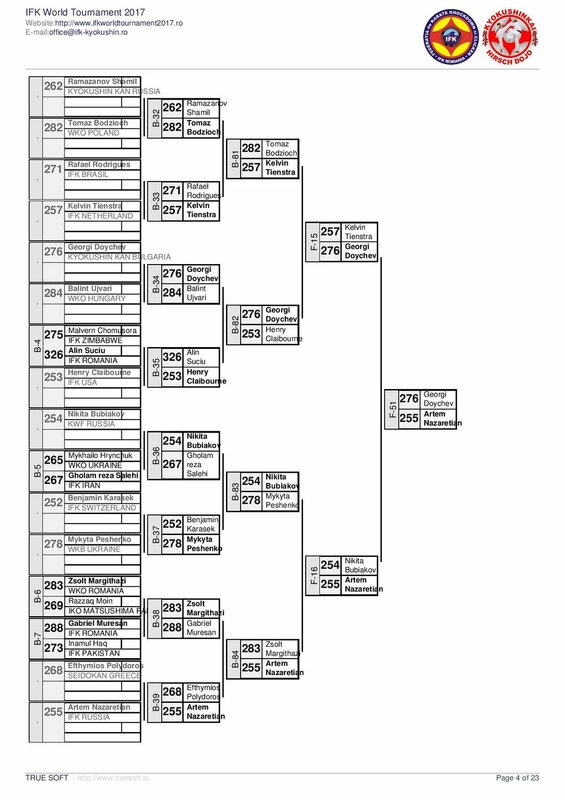 The tournament's level of fighting, as compared to the previous Youth World Championship, has grown considerably. The girls and boys who won the right to hear the anthem of their country are a real strong future of Kyokushin karate. The following is an extract of an article from KWU General Secretary, Sergey Suvorov, commenting on the inclusion of karate into the 2020 Olympics, discusses the prospect of KWU in this process. Everyone knows that World Karate Federation WKF was repeatedly storming Olympic leadership for inclusion of karate in the programme of the Olympic Games and now, finally, the dream of the millions of karatekas all over the world came true and this kind of sports will be represented at the Olympic Games in Tokyo in 2020 year. I’d like to note immediately that this refers now only to the participation in Tokyo Olympics. There 4 more such sports as karate. This is the novation of the International Olympic Committee (IOC) and it deals with the reformatory strategy of the new IOC leadership and personally with the president Tomas Bach. Indeed, according to the Olympic Charter (in essence the charter of IOC) rotation of sports for every Olympics follows the principle one in – one out (one enters and another one exits the programme of the Olympic Games).However, the Olympic Session as the supreme authority has the right to solve any questions, which deal with development of Olympic movement, which was decided after the Olympic Games in Sochi-2014. Therefore, for participation in the programme of Games 2024 WKF will have to go through the difficult voting procedure again under the condition that the country-holder of the Olympic Games will nominate this kind of sports. IFK Russia hosted their Summer Camp in Moscow on the 8th to 12th July under the direction of Hanshi Steve Arneil with the assistance of Shihan David Pickthall, country representative Alexander Taniushkin and Shihan Victor Fomin. 165 Karateka participated in the camp which is aimed towards the regional heads and many of the key organisers from Russia. Hanshi focused on using various IFK teaching methods for kihon and kata and bunkai. Shihan Pickthall worked on kumite and kata training plus sessions with students attempting dan grades. There was also a presentation and session on Kyokushin Kick from Shihan Stanislav Vinokurov from Khabarovsk region, aimed at developing Kyokushin athletes into K-1 and MMA fighters. As always the camp was organised superbly and thanks go out to Sensei Dmitry Shaposhnikov and the organizing team for their tremendous work. Hanshi Steve Arneil answers the question: Does Kyokushin kill femininity? Founder and president of the International Federation of Karate (IFK) Hanshi Steve Arneil - The famous Kyokushin master, 10.Dan in Kyokushin, the student of Sosai Mas Oyama. The first man passed Hyakunin-kumite - 100 man kumite - (21 May 1965) after Sosai, the author of many books about karate and a manuals on basic Kyokushin techniques. On video Hanshi answers of question: Do Kyokushin kills femininity? The IFK is proud to announce the 2nd KWU Kyokushin World Championship among men and women weight categories will be held in Khabarovsk, Russia on 3-4th October, 2015. Representatives of National Federations, who have passed national qualifying championships with calling in all interested Kyokushin groups in a particular country at age 18 years and above, with a style qualification not less than 4th kyu are able to participate in the World Championship. The event was a tremendous success. The motto ‘ time to be United’ showed the level of cooperation between the organisations was truly remarkable. A total of 52 countries were entered into the event and although around 10 countries were refused visas there was still approximately 250 participants. Hanshi Arneil has expressed his heartfelt gratitude for the effort made by all participating countries to make sure the IFK was represented in this event and to give the young athletes from the IFK the opportunity to compete in this first event of its kind. 14 weight Divisions with only 5 kilo weight difference meant the fighters could did not have to worry about weight or board decisions so the champions were truly the best fighters. The IFK were represented at both competitor and judging levels by a total of 19 countries. Armenia, Azerbaijan, Argentina, Belgium, Belarus, Bulgaria, Estonia, Greece, Great Britain, Kuwait, Iran, Ireland, Lebanon, Russia, South Africa, Switzerland, Turkey, Ukraine and USA. The IFK took an incredible 21 of 41 prizes with IFK Russia dominating with 10 Gold medals and 2 Silver.